@antstiller: That's a good branch idea. A bit late now, though, but still a nice touch I could have made. @norbez Ah, now that I know how you did the art I love it even more! With regards to a branch, I would have put one where you could either select The Levitator or The Hummingbird and it was just a pic of the hummingbird from a different angle. And then the branch merges back. Just a small, simple thing. Very charming hand-painted artwork. Always appreciate seeing traditional media in games. Short simple and to the point! I'm not super familiar with the work on which it is based, but it was an enjoyable little experience all on its own. 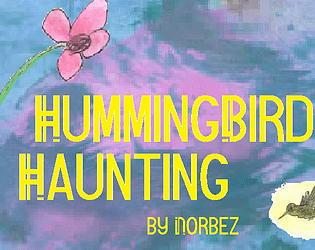 I would agree that it could have benefited from maybe some ambient sounds or the fluttering sounds of a humming bird, but I'm not sure if that's just a limitation of Twine or not since I haven't made much in the engine. Still, very nice work; I'll definitely be checking out some of your other Twine stuff as well when I get the chance! @doonboddy: Glad you appreciated the art, man. And wow, adding hummingbird noises is a great idea. I'm going to look into that! Oh, looks like you've already rechecked my game page! Thanks for that! Very clever interpretation of the theme! Traditional art in a gamejam game is very refreshing, and the poetry works nicely with the illustration (I especially love the colors of the painting on page 2. Good onya for using a lesser known source too. A sweet and beautiful little illustrated poem! Well done. @Galejade: Hmm, that's an interesting idea! I don't know the source material, but I enjoyed reading the twine. I think I agree with most comments. The meat of the game is the art and the meaning, and that's done well. This is adorable! I love the artwork, games with hand-drawn art always seem rare. It's a cute little story, and the writing, while simple, did the job. I enjoyed it. @antstiller: I wonder about putting multiple paths. HBH has always been linear to me. What kind of paths could the story have taken, do you think? Also, that painterly art was actually painted! I used watercolor, an acrylic color, pen & pencils, and some Crayola Twistables to make this art, and scanned it. Ton of fun, though the physical & digital touch-ups were difficult. I'm really happy you see this game as beautiful; that's truly wonderful to hear. @stephen.gurnett: I'm glad to see you replayed it, and that you liked the rhythm. The re-reading mechanic is a very interesting idea (it kinda reminds me of the game Every Day The Same Dream). I'm sorry that I didn't think of it! I don't think I'll be changing HBH with that, but I'm going to keep that mechanic idea in mind for the future; it is a great idea! Also, glad you'll be checking out HCF; it just updated with voice-acting! I hope to see your thoughts soon. The painterly artwork is gorgeous and suits the prose very well. I agree that using the pages to break up the poem worked very well, too. Also, an excellent choice with the poem itself. I would have liked to have seen maybe one option to choose a different path (perhaps with just one different drawing). A beautiful entry for the PD Jam. Interesting take on the poem, mixing the original imagery with a new interpretation. I ended up going through it a few times. The use of pages to break it up gives it an interesting rhythm versus just reading it on a page and the breaks themselves are well chosen. Given that it's short enough I didn't mind re-reading, I wonder if it would be possible to make that a mechanic of the game and vary the text to create new meanings each time. Good work, I've made a note to check out HCF.